faceclams wrote: Maybe it's not as much because of Japan's real life age standards and more because they like to feature young protagonists. 10 year old pokemon trainers and all that. Huh. That makes sense, when we factor in also that the age of consent for Japan is much lower than in the west, which brings more credence to Amy's constant attempts to hook up with Sonic, to the point of marriage. It also explains why the comics made Rotor look older, later on in the comic; in Japan, at his age, he'd be gunning for an independent job that would take the years off of him, so the rougher and older look of him would just be standard for people that age in the East. I was always curious why they did that to him, especially in Mobius: X Years Later, and now I know. Xabin wrote: Huh. That makes sense, when we factor in also that the age of consent for Japan is much lower than in the west, which brings more credence to Amy's constant attempts to hook up with Sonic, to the point of marriage. It also explains why the comics made Rotor look older, later on in the comic; in Japan, at his age, he'd be gunning for an independent job that would take the years off of him, so the rougher and older look of him would just be standard for people that age in the East. I was always curious why they did that to him, especially in Mobius: X Years Later, and now I know. But Archie Sonic is not a Japanese comic, so that's not a valid out-of-universe explanation. No, but it's licensed from a Japanese game company, who - as we all know - have had mandates on what can and can't happen in the comic. It might not fully explain what happened, but they might've just used those aesthetics to please Sega. Pre-reboot would have been in line with Western conceptions of age for sure. Post-reboot will be more in line with Japanese conceptions in order to better match the game brand. I'm pretty sure with Rotor it was just a combination of people not caring/paying attention to how old characters were supposed to be (like Elias and Geoffrey, or how Bunnie went from being younger than Sally to older, or how Sabre suddenly became much younger-looking once it was revealed that he had several older family members running around), not taking into account the math for 25YL, and then the glasses + scruffier look reading as "old" to most people. Maybe, but I do like the alt explanation that was given about it on here. They look about 5 years old. As far as I know these guys didn't have official ages, but if Geoffrey was in his early twenties, Hershey would probably be within that age range to avoid getting creepy. Since Geoffrey was the leader he might be older than the others, so it's not inconceivable that Wombat Stu and Valdez were in their teens. Of course ages later Valdez was retconned to have spied on Locke, so he's retroactively old enough to be their dad! I remember seeing a thing on Know Your Meme which was taken from an image board, and the channers were freaking out that Geoffrey's a full ten years older than Sally, and yet there was an attempt at a romance between them. Actually, what was up with that? Sally's miniseries set up her and Geoffrey, but in the main comic, that seemed to be mostly ignored and she was still having her tension with Sonic and Geoffrey just came across as a hopeless suitor who hated Sonic. ToaArcan wrote: I remember seeing a thing on Know Your Meme which was taken from an image board, and the channers were freaking out that Geoffrey's a full ten years older than Sally, and yet there was an attempt at a romance between them. Because Ken Penders can't write romance worth a dime. He did alright with some of the SOnic/Sally stuff, to be fair. Desperation to crowbar in a 'love triangle'? RaceProUK wrote: Desperation to crowbar in a 'love triangle'? The love triangles were never a good thing, and to be honest, they got worse over time. Sonic/Sally/Geoffrey had some plot relevance. Sally/Sonic/Mina made some level of sense with Mina's character development. Sonic/Fiona/Tails just hindered Fiona's character growth and ended in the worst way possible. Sonic/Sally/Ken just didn't work at all. ToaArcan wrote: The love triangles were never a good thing, and to be honest, they got worse over time. 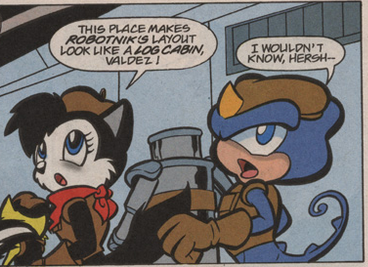 Sonic/Sally/Geoffrey had some plot relevance. Sally/Sonic/Mina made some level of sense with Mina's character development. Sonic/Fiona/Tails just hindered Fiona's character growth and ended in the worst way possible. Sonic/Sally/Ken just didn't work at all. It's pretty clear that Sally and Ken never had any chemistry, they were just being hormonal teenagers and making out. That may be so, but the biggest issue I had with it was Ken deciding to fry Nicole's processor while Sally was still inside it.